The itinerary for my Greek tour with Collette included a day in Olympia Greece, site of the first Olympic Games in 776 B.C. I thoroughly enjoyed my tour of the original race track and the ruins of the magnificent temples and shrines that once surrounded the sports facilities (read more about the earliest Olympics and see more photos in this article). But it was the Archeological Museum in Olympia Greece that left me at a loss for words. In a dedicated room rear the rear of the museum, surrounded by burnished copper walls, stood this stunning statue of Hermes and the Infant Dionysus. The sculpture is traditionally attributed to Praxiteles and has been dated to the 4th century B.C. The head, torso, legs, and left arm were discovered in the Temple of Hera in 1877, buried beneath a thick layer of clay. Later excavations unearthed six additional pieces of the statue but some pieces, such as Hermes’ right forearm are still missing. I stood rooted, trying to wrap my brain around the fact that this stunning piece of art was more than 2,300 years old. Its highly polished surface glowed under the spotlights, and I wondered how such fine detail and exquisite finishing could have been achieved so long ago. If I hadn’t already realized the magnificence of Hermes, the final room in the museum drove home the point. I walked between two rows of crude, poorly proportioned Roman sculptures and wondered how the Romans ever conquered the Greeks. Author’s note: I was a guest of Collette during my Exploring Greece and Its Islands, Featuring Classical Greece, Mykonos & Santorini tour. However, the receipt and acceptance of complimentary items or services will never influence the content, topics, or posts in this blog. I write the truth, the whole truth, and nothing but the truth. Yes, the ancient Greek sculptures are absolutely amazing. No wonder Greece wants to have the Elgin marbles returned! 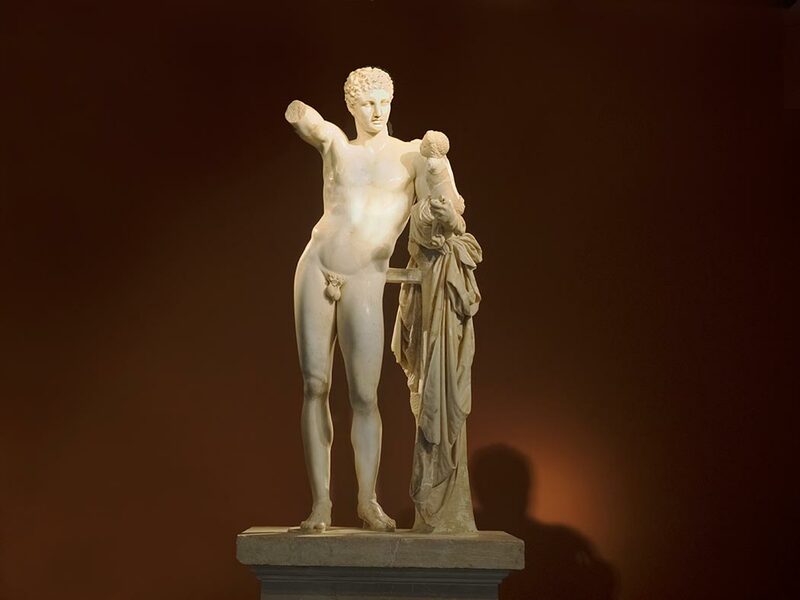 Incidentally, the name of the sculptor credited with having created the Hermes statue is Praxiteles. Oops! That’s my dyslexia creeping in.Thanks for the heads up Khali. I’ve made the correction. It never even crossed my mind that you were trying to give me a hard time, Khali. I’m a lot like you, but it’s really difficult to proof my own work. By the time I hit publish, I’ve seen it too many times, so I always appreciate people alerting me to issues. 2,300 years old! That is incredibly amazing! Wish I could see it for myself in real life! Juan, it was one of the most remarkable sculptures I’ve ever seen. I hope you get to see it someday as well. As a solo single traveller, l ventured to Athens last month. The history of Greece is unfathomable. And he Parthenon literally stopped me in my tracks. Unfortunately l was unable to visit any of the Greek Islands as it’s coming up to peak season. Hi Kaz: Thanks so much for your comment. I actually didn’t do a cruise. I traveled with Collette on a 14-day tour that included the mainland, the Peloponnese peninsula, and the islands of Mykonos and Santorini. We took ferries to the islands.